It's all going a bit slow!! 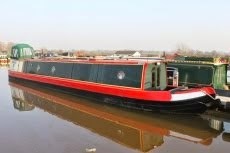 Well here we are at the 26th June, boat prices appear to be settling down a bit looking at apolloduck.co.uk our main indicator of what's available and how much it is. We are still discussing our favoured length of boat, we feel that under 57' but over or around 50' will be our optimum size for fitting our life in. In looking at what might be important factors other than the galley and a forward double, we have been thinking of ways to switch the double to a cross berth for maximum comfort. We also like the idea of a dinette double, somewhere to type and do our paperwork, as well as perhaps fit in a double futon to the stern if the galley isn't there. I'm sure we will look back once we have our boat and have a laugh at all of this. Mysteries feed our imagination and Experiences enlighten our soul!